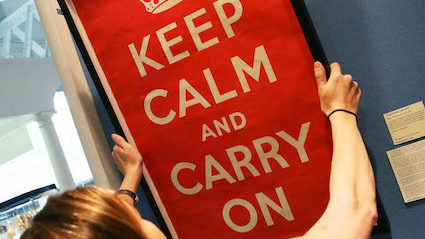 THE UK is determined to make things so desperate that ‘Keep Calm and Carry On’ merchandise is a necessary part of everyday life. Britons feel it is a shame that the iconic poster, created in wartime, was never actually used and believe it is worth wrecking everything to give it a chance to shine. Office manager Roy Hobbs said: “In 2013 I looked at my Keep Calm cushion and thought it was a terrible pity Britain was too happy and prosperous for it to be anything but ironic. Mum-of-two Mary Fisher said: “I really wanted to get the most out of my Keep Calm mug, poster and biscuit tin so I’m totally committed to our current slide into economic ruin. “I hope that once we’ve left the EU with a disastrous no-deal people will see the words shining from their walls, T-shirts and dog baskets and really feel inspired by them.